I know, we can talk about that hubub that came out a month ago about T. rex having scales! Except what is there to talk about? The feather people trotted out their same talking points and said the study doesn’t change anything. Huh. I thought it was pretty cool that we now have hard evidence of integument in advanced tyrannosaurs and these people treat it like evidence of nothing. Well at least there was one leveled headed and reasonable reaction. So what do we talk about now? 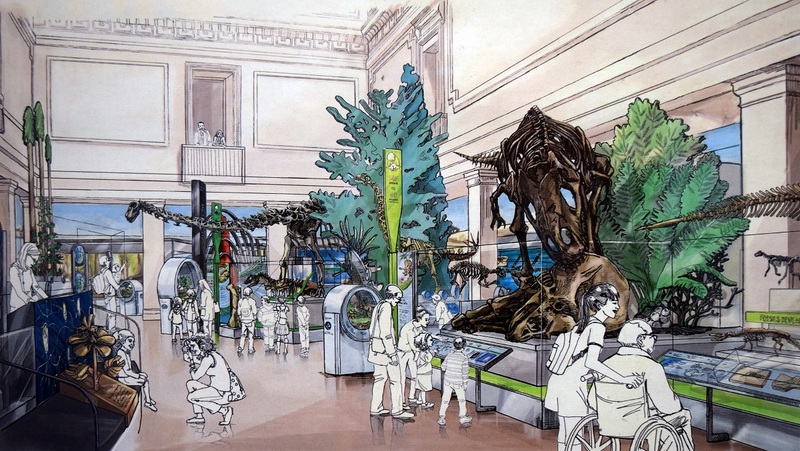 Well I guess there is this concept art of the new fossil hall the Smithsonian is putting together. Sure let’s do that. I absolutely love concept art. Not just for the obvious juxtaposition it provides in comparing the initial idea to the finished product. I love it because even thought it employs many different styles and tools concept art feels like a style all its own. The renderings for the new “national fossil hall” are wonderful examples. They feel especially bright and lively. But what do they reveal about the new hall? What can we expect? What is the goal behind the design? The museum seems to be taking that apparently popular ultra modernist approach. I have talked at length before how much I don’t like this aesthetic. It just feels like an update to the cabinet of curiosities where a bland and sterile setting makes it appear like these are just specimens to be gawked at. There are a few flourishes, like the T. rex eating a triceratops and some real cheap looking fake plants. Dioramas aren’t the only way to create an immersive environment. Lighting, color, architecture, ambiance, sound, and photos/murals can all help to bring the space to life. It appears the exhibit will have some mini dioramas in some weirdly designed cases (seriously, one paleontologist I showed these renderings to asked “What are those, washing machines?”). Furthermore, they seem to be going with the usual focus on whole skeletons. This is another trend I rather dislike. Sure they are impressive and draw the crowds, but they can hinder an exhibit if relied too heavily on. For starters, it limits space. More importantly, it sends the wrong message to the visitors. Complete skeletons are pretty rare in the fossil record. Most fossils consist of isolated elements and fragments. This reality is lost on the public because so many exhibits only display whole skeletons. This approach also fails to properly convey the diversity (in terms of species, forms, and types of life) of past life as not everything is preserved as well as others. T. rex is known from whole skeletons, but Pachycephalosaurus is only known from a few skulls. A museum may have a huge and diverse collection that is crucial to scientific research but people will never know that if only the most picturesque of specimens are displayed. Some isolated or fragmentary fossils could be much more important than the beautiful complete skeleton. And using the full range of the fossil record allows you to much better tell whatever story you are trying to tell. Be it response to change, evolutionary trends, pathologies, extinctions, or whatever, you can create much more informative and comprehensive displays if you go beyond just mounted skeletons. In comparison to the old exhibit, the new version will be influenced by a less-is-more design philosophy. While there will not be quite as many individual specimens on display, those that are included will be more visible and will be explored in more detail. This combined with the significant number of new specimens being added means that many old mainstays had to be cut from the roster. I have two problems with this. The first is the whole “less is more” idea. Most museums use these types of renovations to expand the displays, to bring more of the collections into the public view. Museum collections are not static. They are constantly being added to as new specimens are discovered. This usually allows them to really flesh out their displays and do things they weren’t able to do before. The Smithsonian seems to be going in the opposite direction. Now “less is more” can work but only if it’s done right. Otherwise it’s a step down and can leave many gaps in the narrative you are trying to tell. The other problem is just how much is being removed and being brought back. I did a crude survey of how much was on display before the halls were closed and what will be on display in the new one. I did this using old photographs and memory as well as the Smithsonian’s online collections database (you can actually get the list of what they intend to put on display using the search term “deep time”). Now I only did this with the Mesozoic and the Cenozoic eras. Life for most of the Paleozoic was small, with even the most advance forms at the end being considerably smaller than a lot of the animals that came after. This means their displays can be expanded without taking up too much extra space. The numbers for the other two eras are interesting and even disappointing. Best I can figure, the old Mesozoic hall featured 38 vertebrate specimens. Twelve of these appear to not be returning. Twenty six are set to return. Overall, the new Mesozoic section will have 124 specimens of vertebrates and plants (with invertebrates likely adding many more). That translates to at least 98 new specimens. It looks like the Mesozoic is getting a total overhaul, with something vastly improved over the old incarnation. Contrast this with the Cenozoic. Near as I can determine, the old hall displayed 137 specimens of all types (vertebrate, invertebrate, and plant). The new one will only have 107. The Mesozoic gets increased while the Cenozoic gets downsized. But it’s worse than that. The majority of new specimens will be plants and invertebrates. Most of the vertebrates (45 of the total 107) will be specimens from the old hall with a significant number being taken off view. This is like the new Cenozoic hall at the Natural History Museum of Los Angeles County. Most of the skeletal mounts were just recycled from the old hall. This made the new hall feel like just an updated version of the old one. The dinosaur hall felt new because while we saw a lot of species from the old one, most of them were represented by new specimens. The same appears to be happening with the Smithsonian (as many of the Mesozoic mounts are new specimens that weren’t seen in the old hall). The Mesozoic seems to take up most of the large space while the Cenozoic gets only about a third. Now people will predictably argue that dinosaurs need more space because they are bigger. Yes they are, and this reveals another problem with focusing so heavily on complete skeletons. But consider they story they are trying to tell: life adapting to a changing climate. Each period of the Mesozoic gets a sizable section. The Cenozoic appears to be divided into two sections: One for the Paleogene and Neogene as well as one for the Quaternary (with consists mostly of the Pleistocene epoch). But what about climate in those periods. Dinosaurs had it easy. With a few exceptions here and there, the Mesozoic was warm and humid for its entire history. The Cenozoic, on the other hand, was a very turbulent time in terms of climate change. There is a reason the periods of the Cenozoic are divided into epochs which are usually focused on on their own (as opposed to just the three overarching periods). That is because life changed so much during this time because climate changed so much. It went from: sub tropical swamps and rain forests to a period of intense heat and dryness (the Paleocene-Eocene Thermal Maximum), back to sub tropical rain forests, to sub tropical hard wood forests, to warm deciduous forests, to open grasslands, and finally to ice ages. The Quaternary section seems to be as big as the space occupied by the preceding periods of the Cenozoic. That is bad. The so much happened during that time. There is more change in the ecosystems during just the Miocene than in the whole of the Mesozoic. Are they really trying to cram 64 million years of climatic, environmental, and evolutionary change into that one space? Fail. Of course this problem could be avoided if you focused more on individual specimens instead of just skeletons. So many more specimens, able to tell the story much better and in more detail, can fit into the room taken up by just a few whole skeletons. This also clashes with the “less is more” approach. The diversity of forms seen in life in response to the constantly changing world of the Cenozoic is staggering. That diversity can’t be represented by just a few skeletons of the most commonly found animals. How can you claim to tell a complex story when you are unnecessarily abridging so much of it? Extinct Monsters, can you make any sense of this? Cuts occur for a variety of reasons, including eliminating redundancy, preserving specimens that were not faring well in the open-air exhibit space, and making specimens that have been behind glass for decades available to a new generation of researchers. The second is understandable. But that is what casts are for. And with laser scanning and 3d printing, you can do it with specimens too fragile to cast the traditional way. The third one isn’t as big an issue as it might seem. Museums like San Bernardino County (before it was destroyed), San Diego, and Los Angeles have found ways to display specimens while still leaving them accessible to researchers. Many of them feature cases and support armature that are easy to remove. Access to research is a legitimate concern but not one that can’t be overcome. If a specimen can’t be on display because it can’t be accessed by scientists then that is just bad exhibit design on your part. The first one is just ridiculous. Why? Because like the access issue it’s only a problem if you design your exhibit poorly. 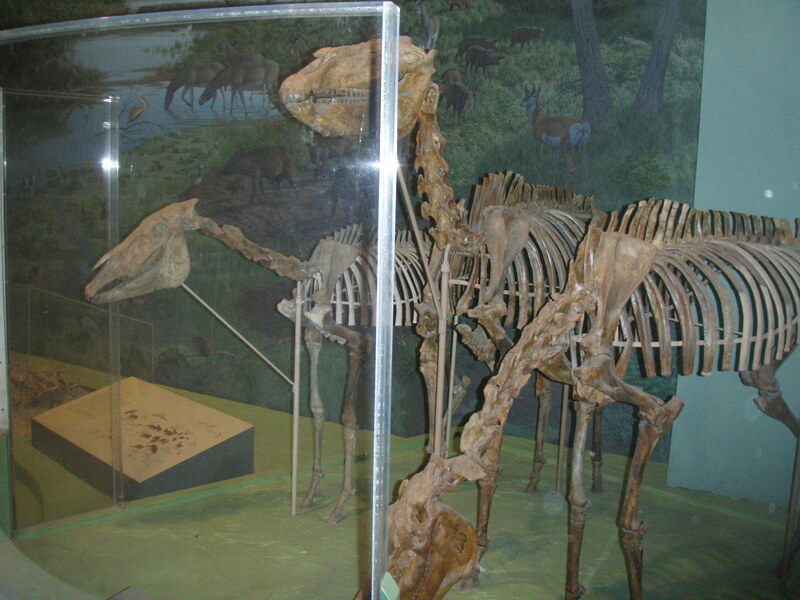 For example, the old hall featured skeletons of the horses: Hyracotherium, Mesohippus, Parahippus, and Equus simplicidens. The new hall will have: Parahippus and Equss occidentalis. Yeah that shows the classic and extraordinary evolution of the horse. In response to changing environments caused by shifting climates no less (you know, the whole point of your exhibit). Why such the extreme culling? Horses are one of the penultimate examples of change in response to climate. Truncating it to just a couple examples is like trying to convey the transition from sea to land with just a fully aquatic fish and a fully terrestrial reptile or with just Tiktaalik and an early amphibian. Again, the whole issue of redundancy and space can be solved if you went with more individual specimens instead of skeletons. Ok three of the same animal is excessive (unless it was part of a specific scene being reconstructed). But the horses come from the Hagerman Fossil beds. In the old hall, a small section was dedicated to this well known locality. It had the horses, the skeletons of two peccaries, a skull of a giant river otter, and a muskrat jaw. All of it now gone. I mean, the Hagerman fossil Beds aren’t that important. It’s only billed as one of the best Pliocene sites in the world. “No other fossil beds preserve such varied land and aquatic species from the time period called the Pliocene Epoch”, according to the park map. The Smithsonian has the principle collection from this unique locality. Only makes sense to not feature it. Especially in an exhibit about changing climate and life adapting to it. Another concerns fossil marine mammals. The Smithsonian claims to have the largest collection of fossil marine mammals in the world. Marine life in the Cenozoic has as much of a diverse and fascinating history as that of land animals. A great deal of museums don’t have them because they are found mostly on the coasts. With such a huge collection, the Smithsonian can put together a display like no other. Except they won’t. Just a seal and a penguin are coming back. The Los Angeles Museum says it has the largest collection of fossil marine mammals outside the Smithsonian. At least they actually made use of that fact when they did redid their Cenozoic hall. It’s actually kind of funny. The museum with the smaller collection has the larger, more in depth display. Good job Smithsonian! First, there are already two big elephants on display: the mammoth and the mastodon. Elephants take up a lot of space, and a third proboscidean offers diminishing returns when compared to the amount of floor space it requires. Folks, it may sound like I am being unfair to the Smithsonian. And I am for a good reason: it’s the Smithsonian! It’s the national museum! It’s one of the biggest and most prestigious museums in the world! And this is what they come up with? If this was just about any other museum, I would be stoked. That is because for most museums this would be a serious step up. But for the Smithsonian, it is a serious step down. They are the only museum I know of to shrink their display instead of expanding it. Sure it will take up the same space, but there will be less on display than before. You know, the complete opposite of what any other museum would do with a renovation like this. But hey, “less is more”. And the fact that they are recycling so much from the old hall just adds to the underwhelming feeling this “new” hall is projecting. They are the Smithsonian. They should be able to display things no one else can. And yet they somehow came up with a plan to create an exhibit that actually steps backwards instead of forwards. I was thinking I’d have to try and save my money so I could fly to DC and see the new hall when it opens. But given how uninspired it looks, I think I can take my time and first visit places with much better fossil halls, like the New Burke and the New Mexico Museum of Natural History and Science (who will be renovating their Cenozoic display for SVP next year). It is just so disappointing to see a place as esteemed as the Smithsonian create something so lackluster. Of course this is all based on concept art. The new hall doesn’t open until 2019. A lot could change in that time. I hope it does. Because I know they can do far better. They say “less is more”. But often times less just ends up being less. This entry was posted in Better Know A Museum and tagged Cenozoic, collections, cretaceous, design, dinosaurs, exhibits, fossil hall, Jurassic, marine mammals, Mesozoic, national, natural history, neogene, paleogene, paleontology, Paleozoic, quaternary, Smithsonian, triassic by accpaleo. Bookmark the permalink. Hi, I write the Extinct Monsters articles and I just happened upon your blog. Love the detailed LACM walkthroughs! I feel compelled to reiterate that I don’t work at NMNH and much of what I’ve written about the new fossil hall is based on my own detective work. Basically, I could easily be wrong! If anything, the new design is anti-modern. They’re restoring the early 20th century architecture and the general look and feel of the original NMNH fossil exhibit from 1911. Because horse evolution has been done (and more often than not, done badly). Seemingly every natural history museum has the obligatory horse evolution section, and historically these have misrepresented the story as a linear one, with horses being “perfected” over time. Rather then retread tired ground, NMNH is going with a less familiar evolutionary story (crocs), which will give visitors a better idea of how a group can adapt to a slew of different niches over deep time. There’s way more Cenozoic marine fossils in the new hall than the sea lion and penguin – Metaxytherium, Pezosiren, and Odobenocetops, for starters. What they have done is cut most (but not all) of the whale material, since there’s now a whole display on whale evolution in Ocean Hall. Honestly, I think the balance of new and returning material seems typical of these sorts of projects. The last iteration of the hall (1981-2014) had a kitchen sink approach, cramming as much into the space as possible. And traffic flow was a serious problem. Giving visitors room to move around and view specimens from multiple angles was a serious consideration in designing the new hall. Based on what I have seen, I hope you are. In architecture only. The displays themselves are sterile and boring, hallmarks of the modern look. There is very little use of color, landscaping, or other things to bring the displays to life. They are just skeletons on display. Just like in 1911. Back to the Future! So reinvent it. Show the branching pattern like some exhibits now do. I’m not saying they HAVE to do it, but when your solution is to just ditch a major component of the fossil record instead of finding ways to make update it and make it unique… That does not instill me with much confidence in their design decisions and abilities. A Tyrannosaur attacking/feeding on another dinosaur isn’t tired ground? Stuffing all the White River animals into one generic display, rather than talk about the fauna’s sequential history, isn’t tired ground? Ooh, bland display stands occupied by complete skeletons, no way that’s ever been done before! From what I can tell, the White River Group will just be used for stock specimens. Just like every other museum. The White River Group is sequential, showing how life changed during a critical point in its history. It’s subtle, but it provides a ready made example for an exhibit supposedly all about change. So far, no museum outside the visitor center at Badlands National Park has done them justice. They have all just been lumped into the Oligocene. Overall, the new hall is isn’t breaking new ground. It’s just the same bland displays stuffed with only complete skeletons. Of all the same species every other major museum has. They are retreading all the old ground. You’re going to have to explain that one. To my knowledge (which is admittedly limited) crocodiles have mostly adapted to the crocodile niche with few exceptions (mekosuchians, Maurosuchus). How do crocodiles do better than things that actually adapted into different niches as time went on? You want to talk about niches, they have a bunch of stuff from South America and other places that would be excellent for that. That’s good to know except 1) Metaxytherium is recycled from the old hall and 2) Pezosiren and Odebenocetops I imagine will be casts. I get there is a certain narrative they are going for, but at the same time it is another example of them handicapping themselves. They brag about having the largest collection of marine mammals but instead decide to feature specially order casts instead of their own specimens. It’s just perplexing. Not the ones I know off. Most museums I have seen renovate throughout my life has always been about expanding. Some stuff does get reused, but it’s usually greatly outnumbered by the new stuff put on display. And often the recycled stuff can feel new if handled right. The new fossil halls at the Los Angeles Museum are a textbook example of both. The fossil mammal hall recycled most of the mounts from the old hall (some not even returning). They were put into a modernly designed hall bereft of imagination and creativity. Hell, only 3 were put into new poses. The new stuff added barely compensated for it. Contrast this with the dinosaur halls. There were only 5 returning mounts and even those felt new because of new poses and scientifically updated anatomy. Some of the same species returned, but felt completely new because they were new specimens that weren’t displayed in the old hall. There were a ton of new individual specimens on display, really bringing their impressive collection into view (unlike the fossil mammal hall. They have an extensive and diverse Cenozoic collection. But instead of that they chose to just display a lot of the same stuff everyone else has). Color, lighting, architecture, and murals all worked together to create an awe inspiring and immersive environment. From the looks of things, the Smithsonian is following the fossil mammal hall approach. That can be a problem, but usually it’s only a problem if you fixate on complete skeletons. Complete skeletons are impressive and pretty to look at, but they take up so much space. How many actual specimens can fit into the space taken up by one skeleton? And only displaying skeletons sends the wrong message to visitors. They are not representative of the fossil record. They are rarely found and yet thanks to large displays of only complete skeletons, people think that’s all paleontologists find or that they are the only thing worth finding. Science is done when you have a wealth of specimens. And complete skeletons make up only a small part of them. A fragmentary or incomplete specimen could be far more informative than a whole, pristine skeleton. By focusing on just complete skeletons, the Smithsonian is again sabotaging itself. They limit space and limit what they can do by only displaying whole skeletons. They claim right on their webpage for this renovation that they possess an “unrivaled collection”. If it is so unrivaled, then why do they have to recycle so much from the old hall? Why can they only display the same stuff that every other major museum does? It’s a good thing displays are not an accurate judge of a museum’s collection because if they were, I’d think the Smithsonian’s was downright average. Again, only a problem if you focus just on complete skeletons. Using individual specimens really lets you display more without having to sacrifice ambient space or efficient traffic flow. Then they handled it in a poor manner. The L.A. Museum’s dinosaur halls managed to display at least 17 skeletons and a few hundred specimens while allowing them to move around freely and view them from multiple angles (that’s why the skeletons were put up on raised platforms). It can be done. I just would have thought the national freaking museum would be more capable of doing it. Apparently they are not. Again, they are not instilling me with much confidence. Artificial landscaping isn’t exactly groundbreaking – habitat dioramas have been a thing for well over a century. Plenty of museums have done the whole immersive environment thing in their paleo exhibits – Carnegie, North Carolina, Indianapolis, etc. These can look good, but again NMNH is deliberately going for a cleaner look with as few artificial elements as possible. It fits well with the space they’re using and the history of the institution. Here’s the thing. You’re arguing that that the exhibit should be thorough and cover everything (horse evolution, the entire White River sequence, and so forth), but also complaining that popular or informative specimens from the old displays are returning. I don’t see how any museum can win here. Eusuchians (modern crocs doing their aquatic ambush hunter thing) don’t show up until the Cretaceous. The earliest crocs were long-legged running animals, and over the Mesozoic they experimented with herbivorous forms, fully marine forms, and other cool stuff. Crocs show that modern survivors don’t necessarily represent the whole evolutionary tree. It’s not that a museum can’t use horses to make a similar point, but why not try something new and see if it helps visitors’ understanding of the concepts? You mention this several times and I don’t know where it’s coming from. The concept art is an overview of the space – it doesn’t include every specimen. You’ve looked through the online specimen database so surely you’ve seen that there are tons of partial vertebrate specimens earmarked for the new exhibit, in addition to the handful of charismatic mounts. Anyways, you’ve clearly made up your mind about disliking the national fossil hall designs. I can’t say I agree! Poor choice of words on my part. What I should have said was natural base. For example, the Royal British Columbia Museum has a display of late Cretaceous fossils mounted on rebar over a bed of the matrix they were found in. Now this may be thought of as cheap or uninspired, but I don’t think so. Few things are more modern than rebar. But when combined with the rock bed, it actually adds a rustic touch. The result: a wonderful fusion of modern and natural. Little flourishes like this don’t take too much work but can really elevate the display. So nothing is new. Instead of trying to find new ways of interpreting the old, just skate along on the bare minimum. I have explained how you can create an immersive environment without dioramas and landscaping. The Los Angeles Museum did it with their dinosaur halls. The Raymond Alf Museum did it with their new Hall of Life. The Florida Museum did it with their Hall of Florida Fossils. Immersive doesn’t automatically mean recreated world. It means drawing visitors into the displays. There is more than one way to achieve that. And the end result is something that looks so artificial that you’d need to be reminded you were looking at specimens of the natural world! If history was such a factor, why not try to make the displays look like they did back then? Why go through the trouble of restoring the historic architecture and then make heavily modern looking displays that end up clashing with it? I have implied that, but I never outright stated it. I was merely perplexed that an exhibit about adaptation to a changing world would cast aside such readymade examples of it. Things that could actually make the exhibit different from everything that has been done before (namely the White River Group). Or find new specimens from their collections that can tell the same story instead of the recycled stuff. But instead they just rehash with a watered down version of the old hall. Because most of the specimens are returning. They didn’t only bring back the really popular (why should that even be a consideration? Museums are supposed to challenge biases, not cater to them) specimens, they brought back everything not deemed “redundant”. The result is something that looks like a giant cosmetic change to the old hall rather than something new to explore. That’s because you are unwittingly or knowingly missing my point. Most museums do in fact “win”. All the museum renovations I have seen brought back things that were popular or important, but they were usually outnumbered (sometimes greatly) by all the new specimens. They bring out very important and informative specimens that were never on display before. This also shows how much the museum collections have grown. What the Smithsonian is doing doesn’t convey that. If anything it shows that hardly anything has changed since the historic period they are trying to emulate. It’s coming from the online database. Look at the specimen records and they feature pictures of complete skeletons. That’s also how I know most of them are returning specimens. They are pictures of the specimens as they were displayed in the old hall! I know that. That is why I use it to comment on the design and the database on the specimen content. We must be looking at two very different databases. The one I’m looking at has most of the new material consisting of plants, invertebrates, and small vertebrates (mainly fish). The few new large specimens are composed mostly of casts (Pezosiren, Paraceratherium, etc). Nowhere near the “tons” you claim. The same database shows that it is not merely a “handful” of charismatic specimens. It shows that the overwhelming majority is composed of these “charismatic” specimens, 99% of which are recycled. That could change. I’m only as good as the information I have. And the information I have suggests the national fossil hall is on a steady course to mediocrity. And I’ll repeat it hear since you clearly missed it in the original post: all this dislike stems from the fact that it is the Smithsonian. The national museum. I know they can do so much better. By defending their bland and basic hall design consisting of mostly recycled materials, you’re implying they can’t. They are the ones bragging about having an “unrivaled collection”(their words). Having your new hall consist mostly of reused specimens does not suggest an “unrivaled collection”. Have their collections not grown or changed in the 30 or so years since their last renovation of the hall? I know what’s in their collections. They can display things no one else can. It’s like the Cenozoic hall at the Los Angeles Museum. I know the collections they have and they could have created a fossil mammal hall that couldn’t be found anywhere else. 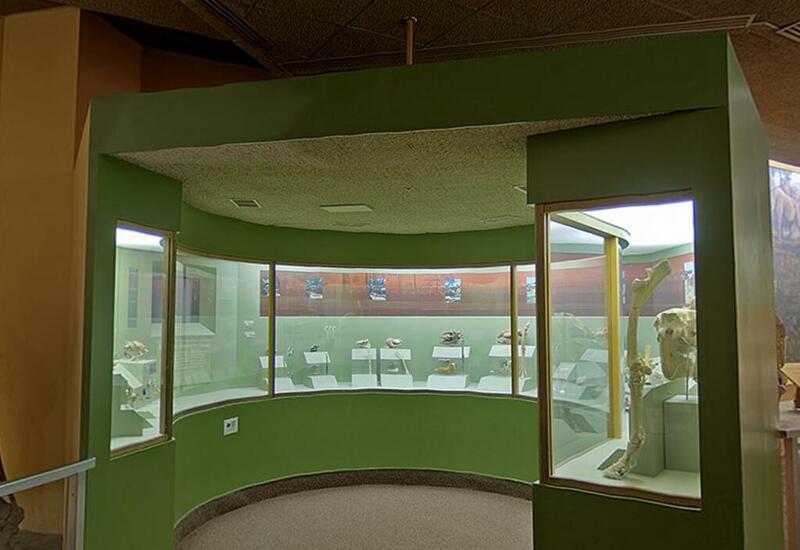 But rather than be different, both museums opted to have the same displays everyone else has (complete skeletons from the Eocene of Wyoming, the Oligocene of South Dakota/Nebraska, and Miocene of Nebraska). And in both cases they recycled so much of the old hall (though a few brownie points to Los Angeles as they at least added more new stuff, much more than the Smithsonian is apparently). This would be like the Denver Museum of Nature and Science redoing Prehistoric Journey and just bringing back everything from the old incarnation. Instead of adding some of the Miocene fossils they’ve been turning up in Oregon and Colorado; or the Eocene of Bighorn Basin, Wyoming (with what they have been finding they could do a much more detailed display than the big museums have. You know, actually talk about instead of just offering up a few specimens as a coverall example of Eocene life); all the dinosaurs they have been finding in Utah and New Mexico; and the big pile of Pleistocene material from Snowmass. What logical sense would that make? How do you have an “unrivaled collection” and come up with a fossil hall as pedestrian and lame as the Smithsonian’s? For the love of god, they don’t even have a T. rex. The national museum doesn’t even have a T. Rex. They had to borrow one from the Museum of the Rockies! Who has an “unrivaled collection” and has to borrow something most of its supposed inferiors have? They have large collections of marine mammals from the Calvert Cliffs and Sharktooth Hill, part of the largest collection of marine mammals in the world. And all they add to the display is a cast of an early sea cow and a skull from South America (I was wrong, Odobenocetops isn’t a cast). I just don’t understand how far smaller museums (San Diego, Raymond Alf, New Mexico, Utah Field House, Los Angeles dinosaur halls) with more sparse collections can show more imagination and innovation than the national freaking museum! If this was any other museum, I’d be cheering it on. Because for any other museum, this would be a big step up. But for this one museum, it’s a big step down. “ I can’t say I agree! You don’t have to. You’re entitled to your opinion like the rest of us.